McALLEN — The Mexican Consulate here and the McAllen Public Library announced a Spanish-language children’s festival taking place later this month. “Francisco Gabilondo Soler Cri-Cri,” is the first event of its kind, said consulate general Socorro Jorge-Cholula. The event is a part of the consulate’s initiative to promote culture among Mexicans and Mexican-Americans outside of Mexico. The event, which takes place April 25, lands right on the Mexican holiday, Día del Niño, or Kid’s Day. 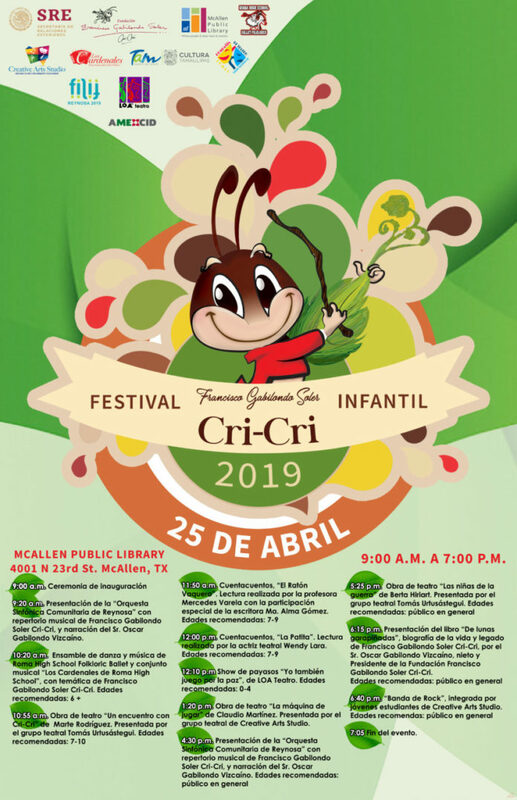 The event celebrates the Mexican composer Francisco Gabilondo Soler, who composed and performed children’s songs under the name “Cri-Cri: El Grillito Cantor,” or the singing cricket. The event will feature Soler’s music and plays as well as children’s books where Cri Cri is featured. The consulate has been organizing the event with the Library since November. All of the events are put on by either the consulate, the library or various community organizations on both sides of the border. Through this event, the consulate hopes to promote bilingualism among Valley youth. Often, it’s easy for children to forget Spanish once they go to school, especially if their parents speak English at home. However, being conversational and literate in two languages is becoming more of an expectation as time passes. “We want to make knowing Spanish cool,” Jorge-Cholula said. From 9 a.m. through 4 p.m. the event will be open for school visits only. However, from 4 through 7 p.m. the event is open for all participants. Editor’s note: This story has been updated to reflect the correct event times.